Spin three or more trees anywhere on the board to trigger the Tree Climb feature. Click here to play! During this second-screen game, you will have to choose one of the lumber cats in a race up the trees. Your bonus payout will depend on your chosen cat's finishing postiion in the race. The safe is a scatter symbol. Three or more anywhere on the board will multiply your total bet up to 50 times. It will also trigger a number of free pins in which all wins are doubled. 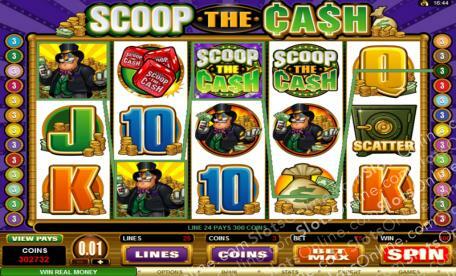 The Scoop the Cash logo is a substitute. It will replace all other symbols except the scatter and bonus symbols. Three or more red dice anywhere on the board will trigger a dice throwing bonus round. During this game, you will toss the dice for a chance to win the paytable sum of the dice roll, a bonus of 20x the total triggering bet, or win a bonus of 100x the trigger bet.